A New Performance Standard in Gantry CMMs - CMM Inc. The DEA DELTA SLANT excels in high-accuracy inspection of large castings and machined parts. This system is the ideal solution for parts manufactured in automotive, aerospace, heavy transportation, and communication industries. The DEA Delta Slant is available in two versions: Classic and Performance. Both configurations may be equipped with an optional "SF Kit" (Shop Floor) featuring protection from environmental contamination as well as multi-sensor thermal compensation. The design on both versions provides easy loading and integration capability with a variety of material handling systems. The DEA Delta Slant is available with all the latest Hexagon Metrology sensor technology -such as TESASTAR-m indexing probe head, LSP-X5 fixed probe, and CW43L continuous wrist. 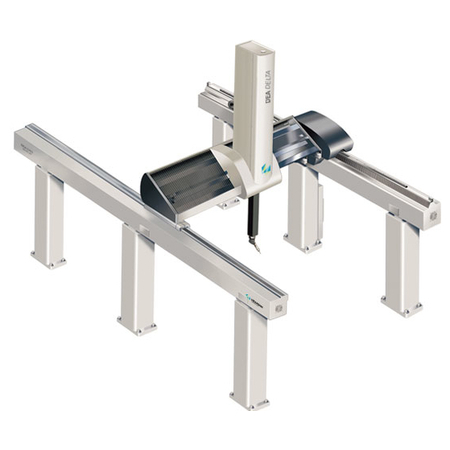 The system is also equipped with state-of-the-art features such as dual encoders and high-stiffness-to-weight "Tricision" beam for the main carriage and high-resolution scales for all axes.